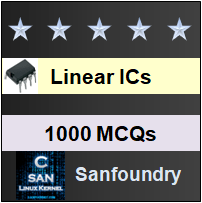 This set of Linear Integrated Circuit Multiple Choice Questions & Answers (MCQs) focuses on “Log and Antilog Amplifier”. 1. Which of the following functions does the antilog computation required to perform continuously with log-amps? Explanation: Log-amp can easily perform function such as In(x), Log(x), Sinh(x) to have direct dB display on digital voltmeter and spectrum analyser. 2. Find the circuit that is used to compress the dynamic range of a signal? Explanation: Log amps are used to compress the dynamic range of a signal. 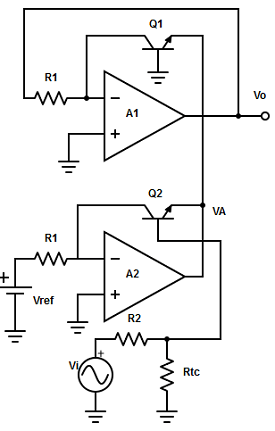 The fundamental log amp circuit consists of a grounded base transistor in the feedback path. Explanation: the output voltage is proportional to the logarithm of input voltage. 4. How to provide saturation current and temperature compensation in log-amp? Explanation: The emitter saturation current varies from transistor to transistor with temperature. Therefore, the input and reference voltage are applied to separate log-amps and two transistors are integrated close together in the same silicon wafer. This provides a close match of the saturation currents and ensures good thermal tracking. 5. The input voltage, 6v and reference voltage, 4 v are applied to a log-amp with saturation current and temperature compensation. Find the output voltage of the log-amp? 6. Find the circuit used for compensating dependency of temperature in the output voltage? Explanation: The temperature dependence on the output voltage is compensated by connecting an op-amp which provide a non-inverting gain of [1+ (R2/ RTC)] at the output of the log-amp with saturation current compensation. Now the output voltage becomes,VO = [1+ (R2/ RTC)]×[(kT/q)×ln(Vi / Vref)] Where, RTC –> temperature sensitive resistance with a positive co-efficient of temperature. Where k’ = 0.4343 (q/kt)×[(RTC/ (R2 +RTC)]. 8. 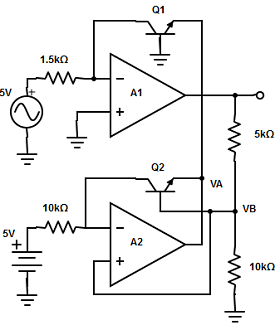 Calculate the base voltage of Q2 transistor in the log-amp using two op-amps? Explanation: The base voltage of Q2 transistor, VB = [RTC / (R2 +RTC)]×(Vi) = [10kΩ/(5kΩ+10kΩ)]×5v =3.33v.